Rocky Mountain Clean Air Action put CEMEX, Inc. on notice today that it intends to file suit in federal court to clean up the company's coal burning cement plant in Lyons, which threatens peoples' health and Rocky Mountain National Park. According to Colorado Air Pollution Control Division records, the kiln at the Lyons cement plant has been modified numerous times since 1979, leading to steady increases in air pollution from the smokestack. Under the Clean Air Act, best available pollution controls must be installed whenever a modification leads to increased air pollution. The cement plant has now been illegally operating without pollution controls for nearly three decades. Under the Clean Air Act, citizens can file suit against polluters to hold them accountable to clean air after giving them 60 days notice. Civil penalties can also be assessed. Polluters can be fined up to $32,500 per violation per day under federal law. CEMEX could be required to pay over $500,000,000 in civil penalties because of its violations. 53 pounds of mercury are released annually. The amount of mercury released by the cement plant is equivalent to the mercury in over 34,000 household thermometers (53 pounds * 453.5 grams/lb. = 24,035.5 grams/0.7 grams per thermometer = 34,336). 0.114 grams of dioxins are released annually. The National Research Council of the National Academies recently described dioxin as "among the most toxic anthropogenic substance ever identified." There is no "safe" level of exposure to dioxin. After 60 days, citizens can file suit against CEMEX in U.S. District Court in Denver. Once in court, citizens will ask a federal judge to hold CEMEX in violation of the law, to require CEMEX to install pollution controls, and to require CEMEX to pay civil penalties for its violations. The Colorado Air Pollution Control Division says that much of Denver's ozone pollution, or smog, is blown in from neighboring states At the same time, the Division says that Colorado's smog has no effect on neighboring states. Yes, this double standard is confusing. But more than that, it almost seems as if the state of Colorado is turning its back on smog pollution, even though it's the most widespread threat to the health of local communities. New Mexico: Health standards for smog were exceeded 15 times last summer, primarily in northwestern New Mexico, but also in the Las Cruces area. Utah: The Salt Lake City metro region is on the verge of violating health standards for smog. If smog levels reach 80 parts per billion or higher in Bountiful this summer, there will be a violation. Smog levels have reached 80 parts per billion 3 of the last 5 years. Utah: Smog levels peaked at 138 parts per billion last summer in Zion National Park, nearly 75% higher than federal health standards. This level of smog pollution was higher than Denver's and Salt Lake City's. Wyoming: In rural southwestern Wyoming, health standards for smog were exceeded 9 times in 2005 and 2006. Although the situation is not dire, trends are not looking good. Under the Clean Air Act, states are supposed to make sure their air pollution doesn't affect neighboring states. Colorado, for example, needs to make sure its pollution doesn't affect Salt Lake City. At a hearing last week however, the Division claimed that Colorado's air pollution is not blowing into downwind states and contributing to unhealthy smog. This claim doesn't entirely add up. In a presentation to the Air Quality Control Commission, Rocky Mountain Clean Air Action explained why. One need only look at the rise in air pollution from oil and gas development. In western Colorado, oil and gas developments now release 20% of all nitrogen oxides, a key smog forming pollutant, more than is released by all the traffic. Smog is no longer an isolated problem in the west, it's a regional issue that calls for regional solutions. Colorado needs to keep its smog and smog forming pollution in check to protect downwind communities before things get even worse. Elevated Voices, the 5280 Blog: Jason Bane offers extremely helpful media relations advice. Please heed it, he knows what he's talking about. Critterthink, the Center for Native Ecosystems' Blog: The times they are a changing, and when it comes to climate change, the change could not come sooner. Coloradolib: (Renwable) Energy, (renewable) energy, (renewable) energy. Did I mention (renewable) energy? Colorado Confidential: Leslie Robinson tackles a gravelly issue (there's actually an air pollution angle here as well). Coyote Gulch on Global Warming: Is it an issue? Your answer could reveal whether or not you've been asleep for the last six months. From the Styx by Peggy Tibbetts: On top of Western Colorado news...and then some. Westword: It's the Shins, come on. For our readers looking for a break in the clean air news, enjoy! The Cotter Corporation uranium mill in Cañon City, Colorado has been let off the hook--again--and Rocky Mountain Clean Air Action and local citizens have fired back. Last May, the uranium mill not only violated clean air laws by failing to use best available pollution controls, but put the health of the nearby community squarely at risk. The mill, which uses solvent to extract radioactive uranium and vanadium from ores, released over four times the amount of toxic volatile organic compounds it was allowed to release. 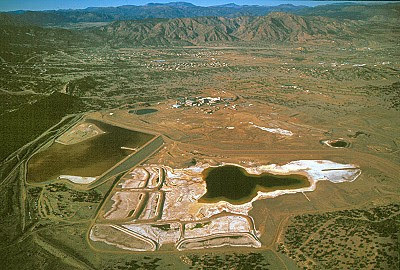 The Cotter uranium mill and its ponds of solvent. This was not an isolated incident. The uranium mill is a chronic polluter and the Colorado Air Pollution Control Division has taken several enforcement actions against the Cotter Corporation for violating clean air laws. The state of Colorado even has a webpage dedicated solely to the Cotter uranium mill because of the problems at the mill. This is all extremely disturbing since the mill processes radioactive materials. Despite its sordid air pollution history, the Colorado Air Pollution Control Division gave the Cotter uranium mill what amounts to a gentle slap on the wrist for air violations last May. Not only did the state levy a meager fine, but the state didn't even require the uranium mill to install pollution controls. In fact, the state didn't even revoke Cotter's air pollution permit. The uranium mill is still free to operate, pollute the air, and put peoples' health at risk. Rocky Mountain Clean Air Action, Colorado Citizens Against ToxicWaste, and the Lincoln Park community of Cañon City have asked the Colorado Air Pollution Control Division to stick up for clean air when it comes to the Cotter uranium mill. It's one thing to give a polluter a chance to clean up its act. It's another thing to let a polluter off the hook when it continually violates clean air laws, especially when that polluter is a radioactive uranium mill. Xcel claims that it will be reducing air pollution from the Pawnee power plant, a massive coal burning power plant located northeast of Denver. The claim is not entirely true. In 2006, the Pawnee power plant releases 3,464 tons of nitrogen oxides. Nitrogen oxides contribute to smog pollution, form acid rain, and harm the lungs of children. The amount of nitrogen oxides released from the Pawnee power plant in 2006 was as much as the amount released by over 181,000 cars. The Pawnee power plant emits nitrogen oxides at a rate of 0.21 pounds per million Btus of coal burned. Xcel is now claiming to "reduce" its nitrogen oxide by emitting 0.23 pounds per million Btus. This is not a cut. This is an increase in pollution. Xcel needs to get its math right. What's more, Xcel needs to significantly reduce nitrogen oxide emissions from the Pawnee power plant. Coal burning power plants will significantly reduce mercury emissions in Colorado in the coming years, thanks to an agreement reached between utility companies, local public health agencies, and advocacy groups. The recent agreement culminates a long, drawn out process where utility companies here in Colorado stonewalled efforts to secure actual reductions in mercury emissions, even though recent data shows that coal burning power plants release more mercury than ever before and even though the list of waterbodies contaminated with mercury continues to grow. Thankfully, Colorado utility companies agreed to a healthy compromise where mercury emissions from Xcel's Pawnee Station near Brush and the Platte River Power Authority's Rawhide Energy Station near Fort Collins must be reduced by 80% by 2012. Other power plants will be required to meet similar reductions by 2014. But really, what we're most thankful for is that people like Vickie Patton with Environmental Defense, Pam Milmoe with the Boulder County Public Health, and Gregg Thomas with Denver Department of Environmental Health stood up for what's best for our health and stood firm in their commitment to securing significant mercury reductions. Their efforts are to be commended. The St. Vrain Valley Community Watchdogs have taken aim against CEMEX, and how their recent lies are threatening the health of the Lyons, Colorado community. The following guest editorial by the Watchdogs was just printed in the Old Lyons Recorder and is worth a read by anyone who is concerned about the polluters in their community. The Cemex mass mailing letter dated January 2007 began with a warm and folksy "Dear Neighbor" and was ended by the current Plant Manager Steve Goodrich with a "Sincerely yours." In between, numerous typos and misspellings can be noted, and a statement that news is provided that "closes the books on past events." Importantly, and far more disturbing, one finds Cemex's attempt to describe and sum-up its permit compliance problems as "primarily data monitoring issues." It's hard to know just where to begin addressing the lack of candor and sincerity in this letter. But a good start is to say that many residents in the community found the letter to be dismissive of the magnitude of the problems at the Cemex-Lyons plant and many of us found the letter offensive to our intelligence. We found chatter about distribution of penalty fines, chatter about a brief moratorium on burning tires (keep in mind that The Sierra Club law suit related to this matter is not yet resolved) and chatter about dust control (an important, yet secondary, compliance issue). We found mention that emissions testing was undertaken after discovery of operational temperature exceedances, and that testing indicated no threat to public health, but we found no mention or acknowledgement that for years the Plant failed to notice and/or to self-report (as required by its permit) thousands of these operational problems. We found no acknowledgement that they had to be advised of the temperature exceedances by the Colorado Air Quality Control Division that regulates and oversees the Plant's air quality permits. We found no acknowledgement that at the time of the alleged temperature exceedances no one knew what emissions might be being released into our community. And we found no news that specifically addressed any changes being made at the Plant that resolve the problems at the Plant that resulted in 72,067 temperature exceedances recorded during 2004 (keep in mind that many thousand additional alleged exceedances were found by the State during inspection of 2003 and 2005 data). "Based upon the following observations made during Mr. Carr's inspection and other records, CEMEX has failed to operate the Plant in a manner consistent with good air pollution control practices, in violation of Section II, Condition 24.4.1 of Permit No. 95OPBO082." Very briefly, let's examine Cemex's compliance history since 2000. The Colorado Air Quality Control Division provided a very handy history of Cemex compliance from 2000 through 2005 in its Cemex Plant Inspection Report dated June 14th, 2005. The list of deficiencies identified by the state of Colorado is far too long to include here, but the reader is encouraged to contact Mr. Gary Kaufman, Legal Administrator, Colorado Air Quality Control Division, at garrison.kaufman@state.co.us for copies of all inspection and NOV documents. A broad spectrum of types of deficiency is listed for 2000-2004 and it's worth noting a few of them: "Failure to operate the raw material dryer in compliance with the PM limits in the Operating Permit [year 2000]", "Failure to notify the Division of excessive opacity from an upset as required [year 2001]", "Failure to exhaust emissions from the A-frame through baghouse control equipment from April 2001 through August 2003 and claimed 99 percent control efficiency on APEN submitted to the Division on 6/20/03 [year 2003]", and "Failure to operate equipment to [sic] in a manner consistent with good air pollution control practice for minimizing emissions minimize [sic] air pollution, Cemex is using explosives to remove obstructions from within the "conditioning spray tower" which results in predictable emission releases [year 2004]". The State lists 26 additional deficiencies for these years. Take a look at the State's summarized history of Cemex compliance and recall that, as reported in April, 2006 by the Old Lyons Recorder, Cemex promoted the Plant Manager who was at the helm at the Lyons Plant during this time period to the position of national cement operations compliance officer for all 12 Cemex plants across the country: "CEMEX USA is pleased to announce that their Lyons Plant Manager [...] has accepted a national corporate position Cement Operations Compliance Manager. His new responsibilities include serving as the liaison with all CEMEX plants in the USA to ensure full compliance with all environmental regulations. And further, according to the Boulder Daily Camera on April 29th, 2006, he would spearhead a national effort focused on creating a corporate environmental-management system! As Susanna Duarte, V.P., Cemex U.S. Communication & Community Relations, commented, "[the Lyons plant manager's] experience has put him in a position to be a unique asset for the corporation, and we wanted to leverage that at the national level." Cemex is a Mexican-based, cement manufacturing giant with numerous facilities in the US and the rest of the world. Look for yourself at Cemex's compliance record at other plants in the US and Puerto Rico by searching under "Cemex" in the EPA's ECHO website (Enforcement & Compliance History Online) at www.epa.gov/echo/. The EPA has listed seven Cemex operations as "High Priority Violators," of which the Lyons Plant is just one. In response to Cemex issues nationwide, in 2006 the National Alliance of community organizations across the United States (visit http://www.stopcemexmegamine.org) was formed to share resources and to resist and oppose, as needed, the agendas of Cemex in the US. So with all this in mind, ask yourself...what's needed to ensure Cemex-Lyons compliance with its permits? What's needed to determine problem areas within the Plant? What yardstick does the community need to measure compliance efforts? A thorough, independent, environmental engineering audit would be a good place to begin. And the results should be made public along with a summary of how and when Cemex will address each issue raised by the audit. It must be, as a minimum, a thorough and candid assessment of equipment, monitoring devices, computer software, management and operations protocol, staff, staff training, and other similar categories. Protect what is closest to your heart: your family, friends, and lungs.